Cardiff City boss Russell Slade says owner Vincent Tan is still committed to the club and is prepared to strengthen the squad in the January window. The Malaysian businessman has been to just one match this season, the 2-2 draw at Queen's Park Rangers in August, and just two matches in 2015. But Slade is adamant that Tan's interest is still as high as ever. "The owner is keen for us to be successful and strengthen if necessary in January," Slade said. "I had a good conversation with Vincent two days ago, he's obviously aware of the injuries and that we're working hard to stay in there... he's watching every game. "Together we'll have a look at it in that January window." 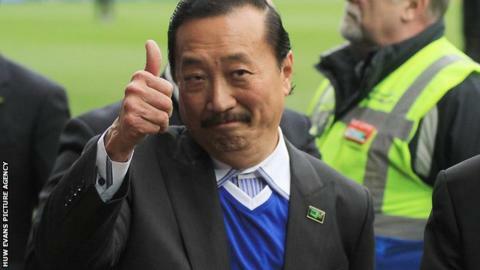 Cardiff are one of four clubs that Tan is involved in, with Belgian club KV Kortrijkt, Sarajevo in Bosnia-Herzegovina and a minority stake in Los Angeles FC in the USA part of his sporting portfolio. Tan courted controversy when he changed Cardiff's home kit from blue to red in June 2012, before changing it back to blue again in January 2015. Since the appointment of Slade in October last year Tan has scaled back his investment in the Bluebirds, with high-earning players being allowed to leave and very little spent in the transfer market. Whilst being difficult to beat, Cardiff have found goals hard to come by at the other end, with their only score in their last three games an own-goal by Middlesbrough's George Friend. That could see Slade look to add to his striking options in the new year with the backing of Tan. Slade would not be drawn on what funds he would have available to him, but when asked directly if the owner was prepared to back him he said "absolutely." Despite the lack of goals, Cardiff are eighth in the Championship table - three points off the play-off places - and unbeaten in five games. The Bluebirds travel to Ipswich Town on Saturday with midfielder Kagisho Dikgacoi doubtful because of a hamstring injury. Striker Kenwyne Jones remains on course to return for the trip to Leeds United on Tuesday, 3 November.